IDisplay.tv is our brand of digital signage. As a business, we understand the importance of advertising to increase sales and profit. That is why we are offering our IDisplay.tv Advertising services. We offer our IDisplay.tv Advertising services with both Advertiser options and Host options. For our Advertisers, we wanted to create a product that consumers wouldn’t mind watching while in a waiting room or in a restaurant. We accomplished this by giving them live content such as sports, news, and weather, all while your ad is being displayed. As an advertiser we let you control what level and what exposure you want. You can advertise in just your market or all the way to global sponsor ads which display on all monitors in all markets. You decide! For our Hosts, not only will you have at least a 42 inch screen to use in your lobby, you also get your ad displayed on all other monitors in your market. Not only do we give you a name brand monitor which will dress up your lobby, waiting room, or restaurant, we can also provide you with music for your business for a very small upgrade. Our music channel is commercial free and includes top 40 music from the 80’s to today. Your customers will love it! Never again listen to ads in your waiting room. Disclaimer:This is the actual IDisplay that will scroll through in your lobby! The text is formatted to fit much bigger screens! Our Host locations are growing quickly and we want to help your company reach people in a way that no other form of advertising can accomplish. IDisplay TV’s are common reference points for local citizens which means they are routinely used as a source of information. No other form of advertisement provides the opportunity to directly target customers in their day to day lives with a visual advertisement for such an inexpensive investment. Digital signage is a modern way to advertise your name, message, or product to a broad range of people. Digital advertising, in most cases, are monitors mounted on walls, with advertising being displayed. Why would I want to advertise on this signage? Our society is mesmerized by flashing lights, moving screens, and words scrolling by. People want to be informed, and they want to know what is happening in today’s world. Providing this type of information alongside appealing advertisements is a great formula for attracting new business because consumers are accustomed to a one stop shopping mentality. IDisplay.tv fulfills the consumers’ desires. Who will see this signage? As a business you understand the importance of spending your advertising dollars wisely. IDisplay.tv’s advertising ability is powerful because it reaches people in their day to day lives. 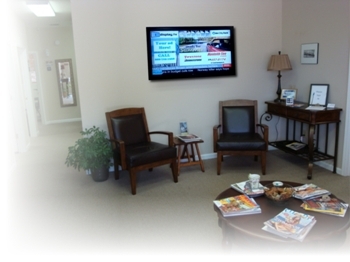 Doctor’s offices, mechanic shops, restaurants are just some of the places where your potential customers will be exposed to the ads on the IDisplay.tv monitor. Its large viewing size makes it easy to read, and the scrolling news, sports, and weather updates make it a valuable resource for trustworthy information, including your advertisement. I am ready to buy an ad or become a host on IDisplay.tv who do I call? We are glad you have chosen to advertise with IDisplay.tv. Feel free to call 888-729-1968. We look forward to hearing from you!